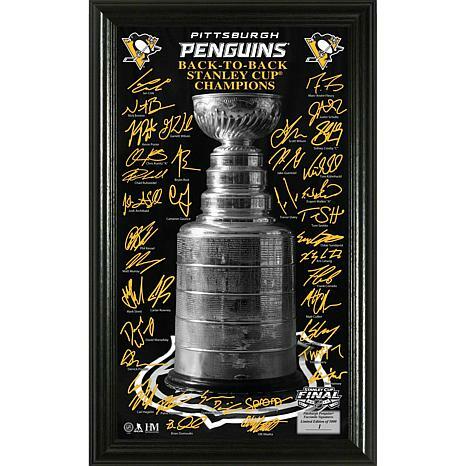 The coveted Stanely Cup trophy is featured on a 10” x 18” glossy photo with the facsimile (exact replica) signatures of the 2017 Stanley Cup Champions roster and delivered in a 12” x 20” frame with a glass front panel! A limited edition of only 5,000, each photo is individually hand numbered and a certificate of authenticity is adhered to the back of each frame. Officially licensed by the NHL and NHLPA. Proudly made in the USA by the Highland Mint.